Berkley Publishing Group, 9780425264652, 290pp. 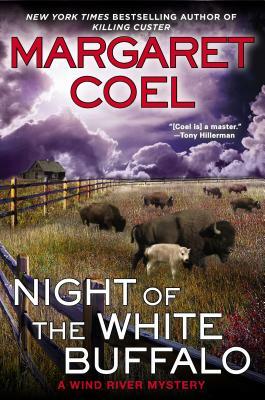 With her gritty mysteries steeped in authentic Native American culture, New York Times bestselling author Margaret Coel is widely considered the most accomplished heir to Tony Hillerman's legacy, (Scripps Howard News Service). In the latest Wind River novel, Arapaho attorney Vicky Holden and Father John O Malley confront a ruthless killer in the wake of a miraculous event. A mysterious penitent confesses to murder, and then flees the confessional before Father John can identify him. Two months later, Vicky discovers rancher Dennis Carey shot dead in his truck along Blue Sky Highway. With the tragic news comes the exposure of an astonishing secret: the most sacred creature in Native American mythology, a white buffalo calf, was recently born on Carey's ranch. Making national headlines, the miraculous animal draws a flood of pilgrims to the reservation, frustrating an already difficult investigation. As visitors throw the reservation into turmoil, Vicky and Father John try to unravel the strange events surrounding both Carey's murder and the recent disappearances of three cowboys from his ranch. Margaret Coel is the New York Times bestselling, award-winning author of the acclaimed novels featuring Father John O Malley and Vicky Holden, as well as the Catherine McLeod Mysteries and several works of nonfiction. Originally a historian by trade, she is considered an expert on the Arapaho Indians. A native of Colorado, she resides in Boulder."